In this week’s blog, I am delighted to welcome Ben Padar to the Extra Help® family. Ben is our latest franchisee and is now running our new Oxford franchise. Ben lives in Oxford with his wife, who is a part-time teacher, and has been a self-employed taxi driver for a number of years. Prior to this, he worked in a publishing company and has a degree in Business and Finance. He has made the wise decision to continue driving so that he will still be earning an income whilst establishing his new business. Recently, Ben decided that, although taxi driving was earning him a living, he needed more security and wanted to find a career that was more challenging and rewarding. He decided to look into franchising, as it felt safer than starting up entirely on his own. “Franchising felt like the more secure option to me as I would be able to utilise an established brand and their tried-and-tested processes and systems,” he says. Ben was attracted to the idea of owning a business that was genuinely rewarding, and came across Extra Help®, along with other, similar franchises. He felt more drawn to Extra Help®, and decided to do some further investigations. After further investigations, Ben decided to go for it. He attended a two-day training course, which was also attended by another new franchisee and a newly-established one. He says the course was useful, in that it covered several aspects of administration and the operation of the business. Since the training course, Ben has been busy setting up his new franchise. He has started distributing leaflets in his local area and will be monitoring the response to get a feel for where the greatest demand is. He has also placed adverts on online sites, as well as in the local, weekly newspaper. He says that Extra Help®’s Head Office has been extremely supportive so far. “I have been in contact with Claire, both by phone and email, and she has told me that if I ever need assistance or have questions, she is always available for me,” he says. Ben says that, due to the nature of his existing job, he comes into contact with many elderly people who, although they are living independently, still require help with day-to-day tasks. Ben believes that one of the best things about being involved with the home-help industry is that you can relieve the elderly and families of some of the pressures they’re under, and that’s incredibly rewarding. Ben’s advice for potential franchisees is to make sure you do thorough investigations before committing to a franchise. He also says that, whichever business you choose, it is essential that you are passionate about it and know it is something you will enjoy and do well. 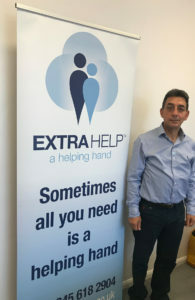 He encourages potential franchisees to consider their goals and aims and whether they are just looking for a business that delivers an income or one that also provides moral satisfaction, as he believes that this is one of the major advantages of being involved with Extra Help®.